It is known overseas property investors are familiar with Italy as a desiderable destination. What is not well known instead no resident buyer won't get a mortgage to purchase the property. Obviously this doesn't mean Italy is a market only for cash buyer. 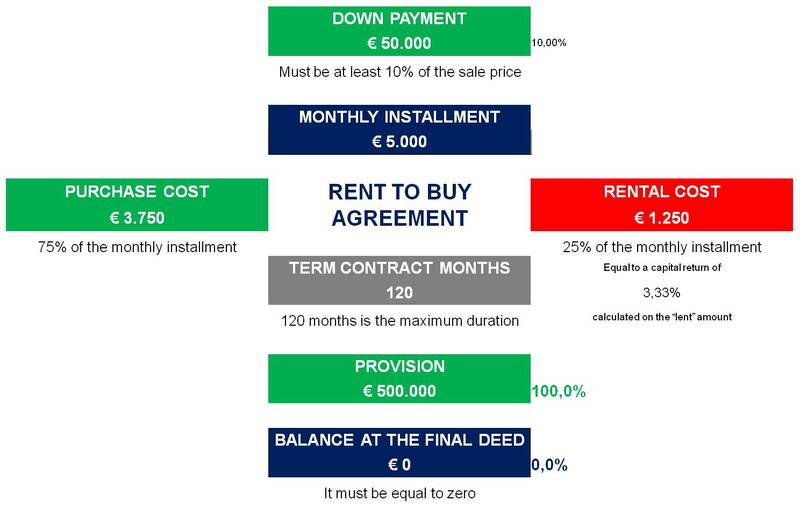 a specific version of the Rent to Buy (or Rent to Own as known in the U.S.A.). Rent to Buy (Rent to Own); the main differences are in the philosophy and duration. addressed to facilitate the mortgage and pay the balance within 3 years. of whom 75% will be paid as purchase price and 25% as rental cost. It's a win to win strategy bringing mutual benefits for both the buyer and seller. on the monthly payment instead the one should have been paid to the bank. (Art. 23 of the Decree n. 103/2014 "Sblocca Italia"). of seller death, bankruptcy or creditor aggression on the property. the ownership right will be transferred once the whole payment will be completed. - 25% as rental cost, which includes a financial revenue of 3.33% for the seller. with french ammortization paid to the bank, while the seller won't apply this banking method. part of the bank interest cost related to the mortgage procedure. of the documents to the bank. With our solution it will be enough the Passport and Codice Fiscale (Tax Number). until won't become the owner. the Long Rent to Buy (Rent to Own) purchaser a rental income.